Why a Beit Midrash in Motion? 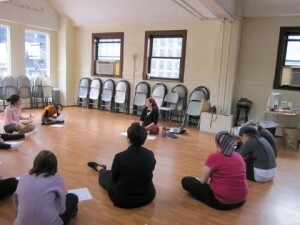 Beit Midrash in Motion workshops fuse Jewish text study, movement, and meditation. They allow opportunities for participants explore Jewish texts with the bodies, minds, and souls. Our workshops are created with the participant in mind and therefore are flexible in terms length, topic, and age-group. We also create workshops that are geared to those with more limited movement abilities. We are happy to select topics for any given group, but we are also always excited to create a workshop for any topic you suggest. To host a Beit Midrash in Motion workshop or workshop series, please contact: info@BeitMidrashinMotion.com.